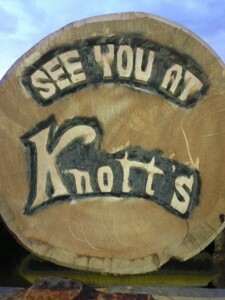 Home » News » Knotts Berry Farm…Here We Come!! Hi friends! Hope this finds you healthy and happy and joyous after a time well spent with family and friends for Thanksgiving! Cheryl and I had a wonderful Thanksgiving and we are so thankful for so many things! This year we were invited back to Knotts Berry Farm in Buena Park, CA to do daily chainsaw sculpture demonstrations from Thanksgiving through Christmas! We are so happy to be here! We left Eureka, MT in early November to get ourselves ready for this fun adventure! We have been preparing for this fun time for a few months now and we are so glad that time is finally here! If you happen to be in area…stop on by and see us!